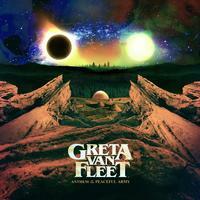 Includes "When the Curtain Falls"
Modern rock n'roll band Greta Van Fleet is to release its highly anticipated new album, Anthem Of The Peaceful Army, on Oct. 19, 2018 via Lava Records. The album iincludes their current single "When The Curtain Falls,'"which is approaching Top 5 airplay at Active Rock radio and is building at Alternative radio. They will re-launch their nearly sold out headlining tour on 9/11 in Canada. Greta Van Fleet recently set a record as the first band in 15 years to hit No. 1 airplay at Active Rock radio with two consecutive singles! Customer Reviews (2.00 Stars) 2 person(s) rated this product. Although these guys present a good "back to the future" performance of 70's rock, and I love 70's rock, this album leaves much to be desired on multiple levels. Obviously they are heavily influenced by Zeppelin (some say a direct ripoff, but I'll not go that far), but fall short musically, lyrically, with little originality.. constant (in every song) use of catch phrases "oh mama" and "c'mon mama" "hey mama" .. with little if any lyrical depth.. So, you have nothing unique musically, shallow fill word lyrics, and mediocre at best musicianship... topped off with an album with muddy, behind neutral sound... I was really disappointed. Anyone want my copy? The vinyl sounds like a muffled mess. Buy 24 bit version and deal with the compression. At least it has pretty good separation. Such a killer album but terrible music distribution. This one needs Analogue productions treatment.